In 1941, when the MOD decided to build the Aerodrome at Tealing, several farms in the area lost large acreage. Those hardest hit were Balnuith (240 acres reduced to 90), Inveraldie, Moatmill, Kirkton of Tealing and Myreton of Claverhouse. Some compensation was paid but it was not substantial. Mrs Ethel Hunter (nee Beattie) recalls " my parents, James and Jessie Beattie bought Inveraldie Farm in 1922. In July 1940 Air Ministry Officials called at the farm to tell my father that, as our farm was the first on level ground outside Dundee and in the interests of national security - they wanted to erect poles at regular intervals in our fields to prevent enemy gliders from landing! Almost immediately we were invaded, not by the enemy, but by workmen trampling down our ripening grain. They couldn't wait until after it was harvested. Early in 1941, the Air Ministry approached my father again an informed him that they were requisitioning the most suitable parts off the farm to build an airbase for fighter aircraft. They promised complete restoration of the land at the end of hostilities, but this never happened". No. 56 Officer Training Unit eventually opened in Tealing in March 1942, equipped with Hurricanes, Masters and some Lysanders. Pilots often had to contend with fog and bad visibility and, because of the Sidlaws at the West, night flying was impossible. The number of pilots training at the unit varied from about 40 in 1942, reaching a peak of 150 in 1943. It was at the aerodrome that Tealing's most famous visitor arrived. On 20 May 1942, a strange four-engined aircraft appeared in the circuit at Tealing. It was one of the first Russian TB7s to visit Britain and it brought Vyacheslav Molotov, Russian Foreign Minister and Deputy Chairman of the State Committee of Defence, on a military mission to meet with Winston Churchill at Chequers. 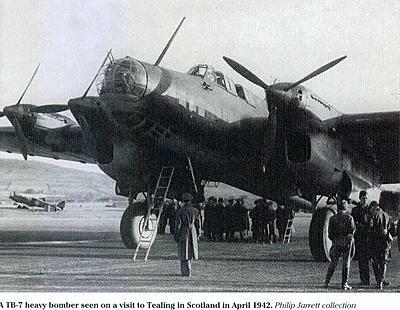 A local WAAF Sargeant remembers seeing the giant TB7 parked on the runway at Tealing. "Britain didn't have anything like it at the time and we were all stunned by the sheer size and presence of it" she said. "There was little pomp and circumstance, the priority was to ensure that Molotov's arrival and departure went smoothly". Tealing airfield was probably chosen to attract as little attention as possible to the visit. Molotov was given the choice of two aircraft in which to continue his journey to England. The one he did not select, as later revealed by Sir Archibald Hope, Senior Controller of Fighter Command in Scotland in 1942, crashed in flames in the Vale of York, killing various members of Molotov's staff and senior RAF personnel. Molotov arrived safely in London for the signing of the Anglo-Russian Treaty, 26 May 1942. In October 1943 the name of the Tealing unit was changed to 1 Tactical Exercise Unit (TEU) under Combat Training Wing, specialising in air firing and evasive action. By January 1944 the TEU was operating up to 110 aircraft. In February 1944, RAF Tealing exchanged 40 Hurricanes for 38 Spitfires from Grangemouth. Just prior to D-Day, 1 TEU at Tealing was put on operational readiness to re-enforce the regulars in the unlikely event of a counter attack from Norway, but the unit was stood down on June 15. The TEU disbanded on 31 July 1944, but during this final month it was host to a large number of Dakotas which were being used to enable locally based troops to practice embarkation. On one day alone, 90 Dakotas arrived from the Cotswolds. In August 1944, Tealing was taken over by Flying Training Command, 9(P) AFU. It disbanded on 21 June 1945 and was placed on care and maintenance under the wing of RAF Montrose.